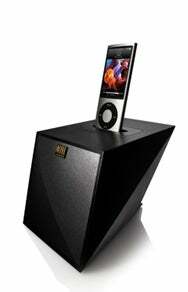 Altec Lansing, the company that brought you the first iPod audio dock, has announced the Octiv Mini. Set to ship in July, the Octiv Mini is a sleek, angular speaker dock with alarm clock capabilities. The first thing you’ll probably notice when you see the Octiv Mini is its head-turning angular design. Aside from making the Octiv Mini look like a modern art piece, this design’s tiny footprint also preserves counter space. Along with playing music from and charging any iPhone or iPod model, the Octiv Mini also serves as an alarm clock. It comes with Altec’s free Alarm Rock app, which lets your iPhone or iPod touch function like a full-featured digital alarm clock, displaying the time and a large snooze button. You can choose whether you’d like to wake up to a song on your iPhone or iPod touch—I recommend choosing a song you don’t much care for, unless you want to associate your favorite tune with being yanked out of dream land—or to a typical alarm sound. The Octiv Mini’s price should also appeal to potential buyers. While the official price is $60, Altec Lansing’s online store lists the Octiv Mini at $50, making it significantly cheaper than most full-sized speaker docks. Given Altec Lansing’s reputation for quality audio devices, anyone looking for a miniature speaker dock should take a look at the Octiv Mini when it comes out. Compact size—smaller than most "iPod alarm clocks"